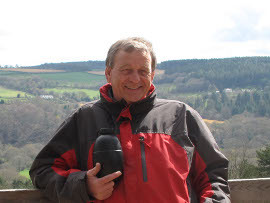 Les Davies is a professional countryman who has spent his life working in the local landscape. He brings a lifetime of experience, personal passion and a proven record for practical application and knowledge to the orcharding and conservation sector. Contact Les for a quote for services tailored to your needs. Our Video page shows Les Davies in action - including a clip with Ellie Harrison on BBC's Countryfile. 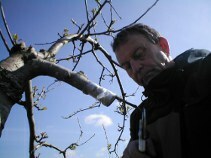 Les has helped to deliver a number of successful orchard restoration events for FWAG (now FWAG SW) in Somerset and Devon over the years. He has a wealth of practical knowledge and his enthusiasm and ‘have a go’ attitude are an inspiration to the farmers and landowners that have attended – we have had lots of excellent feedback. We were delighted to give our apprentices an opportunity to benefit from Les's experience and knowledge. The balance of theory and practical skill was delivered with clarity and humour and was one of the highlights of our seminar programme.